What are South Beach Smoke E-Cigarettes & Vaporizers? 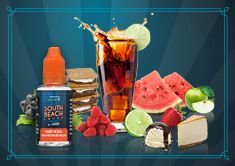 South Beach Smoke E-Cigarettes & Vaporizers are high-tech, advanced devices that enable you to have the most satisfying smokeless nicotine vaping experience imaginable. They combine the most innovative technology and design features to produce an incredibly enjoyable, yet entirely smoke-free and tobacco-free alternative to traditional cigarettes. When vaping with our e-cigarettes and vaporizers, users enjoy powerful hits of nicotine-infused vapor, similar to traditional smoking, only without smoke, tobacco, or combustion. They enable the user to have total control of the device, while producing the largest quantities of vapor and the very best flavors, without sacrificing any of the sensation they are looking for. The award-winning technology behind all South Beach Smoke e-cigarettes and vaporizers offers the highest quality and most superb experience you can get without the smoke! How Do E-Cigarettes & Vaporizers Work? Vaporizers and e-cigarettes use basic e-cigarette technology, with maximized power and performance capabilities. The most essential component of both styles is the battery, which serves as the “brain” of the unit. In addition to being the power source, it also contains a smart chip, which directs all functions. When the electronic cigarette or vaporizer is charged and ready for use, the user inhales, cueing in the smart chip to signal the battery to send a charge to the atomizer. This, in turn, activates the atomizer to power up and heat the nicotine e-liquid, instantly turning it into a hit for the user. A simple yet innovative process. Regardless of which starter kit you choose, it will come with everything you need for vaping. For the best performance, we highly suggest you fully charge your South Beach Smoke batteries before use. Refer to your manual for the proper charging and use instructions. Occasionally, batteries may arrive with some battery percentage, however they should still be charged to full capacity before the first use. This will ensure the best performance over the life of the device. Depending on which model your advanced vaporizer is, you will most likely have a 5-click on/off switch, which means you have to press the power button quickly 5 times within 2 seconds in succession. Automatic switch batteries automatically start up when you puff on them. Manual batteries start up with the push of a button. One of the many benefits to using an advanced vaporizer is that the battery life is significantly longer. To charge your South Beach Smoke vaporizer battery, simply unscrew the battery from the tank and screw the USB charging cable in. 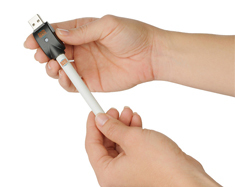 Then connect the other end of the USB cable into either a powered USB port, such as your computer or tablet, or connect it to the wall adapter. During charging, the light on the USB charger will be red, and once charging is complete it will glow green. 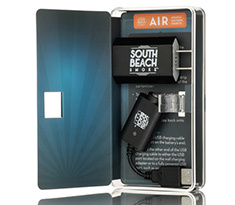 South Beach Smoke e-cigarette batteries are known for being the very best you can get, and they last about 3-400 puffs, or around 1 - 1.5 packs of traditional cigarettes. The indicator “ash” light dims when it needs to recharge. Other signs that your battery is low include difficulty when puffing, or diminished vapor on a relatively new cartridge. You will know when it's time to refill your e-liquid by actually looking at the level in your tank (one of the benefits to a glass tank), or when you notice the flavor is suddenly off or your device is no longer producing vapor. Refilling e-liquid is really simple, however please refer to your user's manual for proper refilling directions. Cartridges begin to stop producing vapor, or give off a burnt flavor when they are running low. 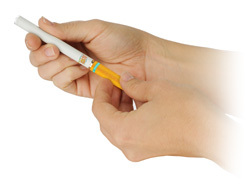 Changing an e-cigarette cartridge is simple; please refer to your user's manual for the exact directions.